Pharmaceutical firm uses Shipping Solutions to comply with U.S. export regulations. Beutlich Pharmaceuticals wanted to replace their typewriter with an easier, more efficient way to complete their export documents as well as perform compliance screening required by U.S. export regulations. Anita Pickens, Beutlich’s international shipper saves more than two hours on the paperwork for each international shipment. She also uses the Shipping Solutions Professional Export Compliance module to make sure they’re not shipping to anyone on a government restricted party list. 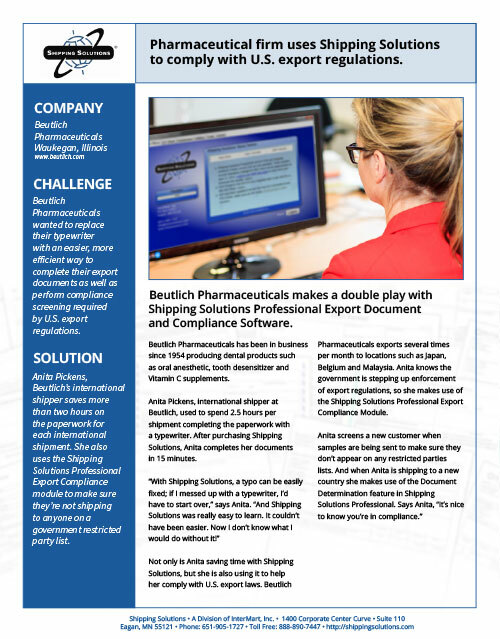 Beutlich Pharmaceuticals makes a double play with Shipping Solutions Professional Export Document and Compliance Software. Beutlich Pharmaceuticals has been in business since 1954 producing dental products such as oral anesthetic, tooth desensitizer and Vitamin C supplements. Anita Pickens, international shipper at Beutlich, used to spend 2.5 hours per shipment completing the paperwork with a typewriter. After purchasing Shipping Solutions, Anita completes her documents in 15 minutes. Not only is Anita saving time with Shipping Solutions, but she is also using it to help her comply with U.S. export laws. Beutlich Pharmaceuticals exports several times per month to locations such as Japan, Belgium and Malaysia. Anita knows the government is stepping up enforcement of export regulations, so she makes use of the Shipping Solutions Professional Export Compliance Module.